Andrew Brown has written at Cif belief St Paul’s must change direction. After the resignation of its dean, St Paul’s must negotiate a peaceful settlement with the protesters, as quickly as possible. The resignation of the dean of St Paul’s Cathedral, Graeme Knowles, has landed responsibility for the crisis with the bishop of London, Richard Chartres. If the dean’s sacrifice is not to be in vain, the bishop must reverse his policy within the next 24 hours, and preferably by tomorrow morning. The alternatives are very much worse. The bishop has a simple choice. Either he plans to throw all the protesters out, or he acquiesces in the presence of some sort of camp right outside his front door for the indefinite future. The lawyers, and perhaps the health-and-safety people, believe he must expel the protesters. The rest of the church sees clearly that this would be wrong in principle, and hugely damaging to the reputation of Christianity. There’s no tidy way out of this, but there is a wrong one, which is to continue digging the grave Knowles had with such effort prepared for the Church of England’s reputation. The bishop will have to defy his own lawyers and negotiate a peaceful settlement with the protesters. Since he must do this, he had best do it at once. To wait for a week and then change his mind would be nearly as disastrous as settling for expulsion…. 1. Immediately welcome the protestors to continue highlighting the issues of financial irresponsibility and the price paid by the poor. 2. Welcome the protestors to remain, on cathedral ground, in negotiated numbers of tents. 3. Immediately publish the suppressed report which is critical of practices in the finance sector. 4. Re-instate Giles Goddard as Canon Chancellor as his position has been vindicated. 5. Invite the protestors to install up to three tents INSIDE the cathedral as a symbolic presence and act of solidarity. In my opinion, the Bishop, by taking a radical control over this situation, would find media support (and witness to our faith) hugely turned round, and in my opinion he would demonstrate his own ability to ‘connect’ and ‘be in touch’ and ‘be decisive’ which are qualities of leadership. Even the ability to listen and change course, actually, communicates humility rather than arrogance. Overnight, St Pauls would find itself portrayed in an entirely different light. Judging by the statement at the news conference which I have just seen, he is determined to throw them out. God help St Paul’s. Nice Freudian slip from Susannah there. Giles Goddard would make an admirable Canon Chancellor (although he has only recently moved to his current parish), but for re-instatement it would have to be Giles Fraser. 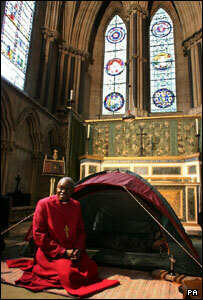 Here’s someone who pitched his tent in a Cathedral: http://newsimg.bbc.co.uk/media/images/41428000/jpg/_41428549_sentamutentpa300.jpg as an act of public witness. Brava Susannah. Too bad it won’t happen because it’s too d@#$ obvious. I remembered that too, Andy, and noted no one sicced the police on his little sideshow! I guess wearing purple and being the right sort counts.